Many domestic industries have already established similar National Certification Standards, including Certified Agricultural Standards (CAS), Taiwan-made Product MIT Smile Logo, etc., which insure product quality and maintain public equity. Being the highest vocational training agency in Taiwan, Workforce Development Agency, Ministry of Labor (WDA) has promoted Quality Accreditation for Competency-Based Program since 2013 and established the iCAP (Integrated Competency and Application) accreditation logo which has made these accredited courses distinguished from other training systems. This act also promotes current training courses and products becoming more consistent with the needs of the labor market and industrial development. WDA stated that iCAP is the only nationally developed training accreditation program and does not charge any certification fees. 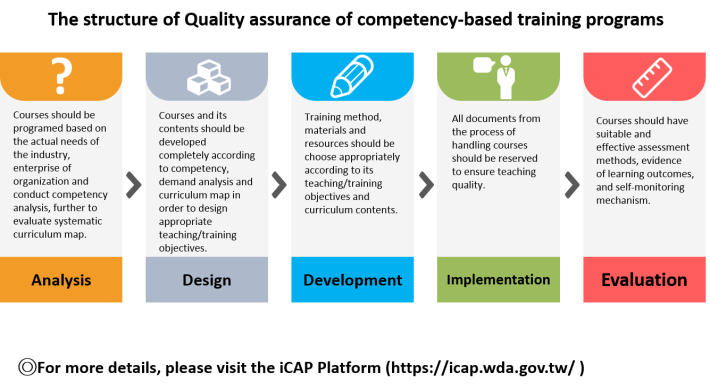 The Accreditation for Competency-based Program ensures trainees do have the ability to meet industry requirements after training and also guarantee the course quality which effectively upgrade training units’ performances. Up to now 263 training programs passed Occupational Competency Standard (OCS) and get iCAP Accreditation. Footwear & Recreation Technology Research Institute (FRT) aware the issue of talents gap, they dismantled key elements of Footwear Manufacturing then developed and accredited tow courses: Footwear Upper Sewing Training and Footwear Upper Sewing Patterning; the employment rates of trainees even reach highest to 90% and reveals training courses indeed effectively improve the development and affirmation for trainees at workplace. FarEasTone Telecommunications Co., Ltd. dedicated and accredited in telemarketing competency training courses since 2017. To track their three-month-after performance, their telemarketing performance reached 21%, which significantly increased with the original performance rate (3% to 5%); the company’s employee retained rate also increased by 6.9% and the average customer satisfaction toward newcomers reached 94%. This produced amazing results for enterprise talent employment and performance. Workforce Development Agency further stated that Competency-based Programs enhances the training quality and performance for enterprises, and evaluates key employability for labors. To assist training units in developing competency-based training programs, WDA provides resources including factsheet, quality accreditation guidebook, assistance and coaching manual, funding subsidy. Please visit iCAP Platform (https://icap.wda.gov.tw) for more information and apply accreditation. Labors can find accredited programs in iCAP Platform and upgrade competency through competency-based training programs. iCAP accredited programs are the quality assurance for employability.